Harryville Homers manager Robert Duddy has described his side’s hat-trick of Irish Junior Cup triumphs as “the stuff of dreams”. 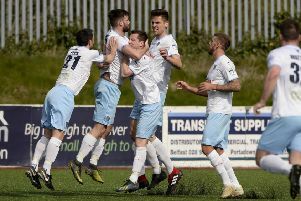 The Ballymena Saturday Morning League champions won the Province’s most prestigious junior football trophy for the third year in a row by beating Rosemount 3-1 in Monday’s final - a repeat of the scoreline when the sides met in the decider a year ago. Chairman of the IFA's Junior Cup committee Gordon Lee presents the trophy to Harryville Homers captain Gary Bonnes. Picture: Press Eye. “I can’t even put it into words,” admitted Duddy. “I’m immensely proud of the boys. “First half we started really well and got a goal early on. “We took our foot off the pedal a wee bit, I thought, after that and missed a few great chances. “It was a really great start, just what we were after and then Alan Rainey had a great chance and couldn’t take it - if we had buried that at 2-0 we would have been hard to stick but give Rosemount their dues, they came back into it and made it really hard for us. “They upped their game too and it was by no means an easy win. Duddy also paid tribute to captain and talisman Gary Bonnes, whose two late goals clinched the victory. “What can you say about Gary? “He wasn’t really in the game for spells and then he does that. “That’s what the captain is there for - he was quiet and then he just comes alive and wins the game for us. “To win the Junior Cup once was an unbelievable achievement; to win it twice was probably the pinnacle of these boys’ careers but to win it three times is the stuff of dreams. “I’m chuffed to bits for everyone connected with the club - even the boys who weren’t involved today all played their part throughout the year,” added Robert.